A couple of years ago, Idaho Sen. Mike Crapo made waves by pitching an idea grounded in common sense: Get all the players at the table to discuss resuscitation of declining Snake River salmon populations. Environmentalists celebrated Crapo's statement that breaching four salmon-killing lower Snake dams needed to be on the table. Power producers latched onto the second half of that statement-- that not breaching the dams also needed to be considered. And so, following this week's ruling by U.S. District Judge James Redden, we find ourselves starting over, once again. Redden tossed the Obama administration's plan for protecting endangered salmon, just as he did with similar federal plans in 2000 and 2004. Billions of dollars have been spent. Everything, save dam breaching, has been tried. 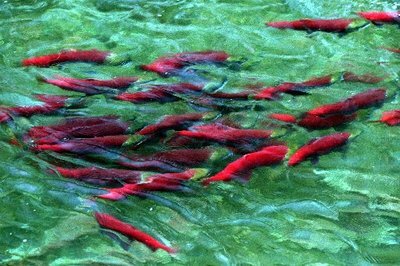 And still salmon runs fall well short of numbers required by the Endangered Species Act. The cycle continues to the detriment of everyone, except, of course, the water lawyers. Redden's ruling could not be clearer: "As I have previously found, there is ample evidence in the record that indicates that the operation of the (Federal Columbia River Power System) causes substantial harm to listed salmonoids," Redden wrote. Continued operation of that power system, Redden wrote, will cause "irreparable harm" to a creature not only deserving of federal protection but also vital to Idaho's economy. A 2005 study showed restored salmon and steelhead runs could result in an annual $544 million boost to Idaho's economy. That includes $26.7 million for Challis and $40.4 million for Salmon. Clearly this stalemate needs to end. That brings us back to Crapo. The collaborative model Crapo used to protect the Owyhee Canyonlands is the most realistic shot we have at breaking this discouraging cycle of federal plans being hatched, environmental groups filing suit and Redden calling for do-overs. Make no mistake, dam breaching is the best way to save the wild salmon, but that would require an act of Congress, something that will not happen so long as Washington state's Doc Hastings chairs the House Natural Resources Committee. Redden gave the feds until 2014 to come up with a solution. That all but guarantees no action until after the next year's presidential election. It also gives the parties time to ruminate upon this truth: There is no point in returning to the same old failed model. This admittedly complex problem needs a solution. That means getting everyone--the feds, Idaho, Oregon and Washington, the tribes, port communities, environmentalists and biologists--to the table. As Crapo said two years ago, "All options must be openly and fairly discussed." Given what has taken place the past decade, it's difficult to see how anyone could argue with that.